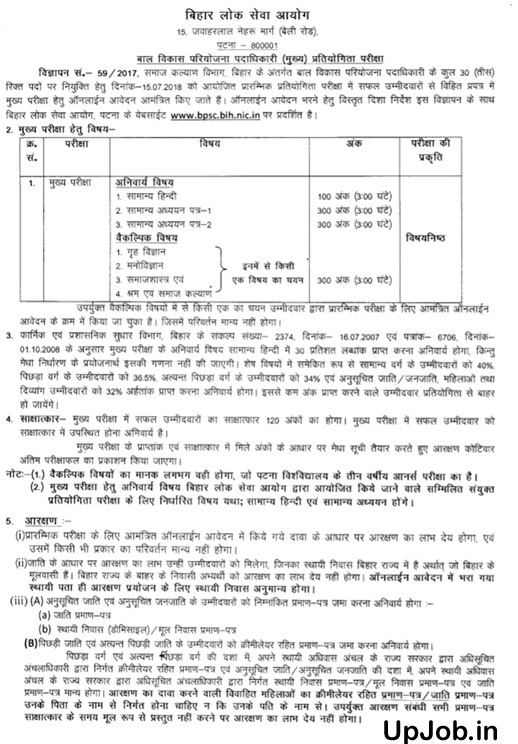 Bihar Public Service Commission has published official syllabus and examination pattern for the child development project officer CDPO Mains examination 2018. All those candidates who have been declared qualified for the Bihar Lok Seva Ayog Bal Vikas Pariyojna padadhikari Pratiyogita Pariksha they can download the official syllabus and question paper pattern from here. BPSC has conducted the pre examination for recruitment of 30 Post. Prelims written examination was held on 15 July 2018 for the screening of the candidates. Candidates are required to select any one subject in given optional subjects. Only those candidates who have been declared qualified in the preliminary examination they will be called for Mains examination. Candidates are required to score at least 30% qualifying cut off marks in Hindi subject. Marks of Hindi subject will not added in the final merit list preparation. Candidates are required to score at least 40% marks aggregate. Candidates are required to score minimum qualifying cut off marks for call of personal interview test. All those candidates who will be declared qualified in the mains examination they will be call for personal interview test. Personal interview test for cdpo examination will carry 120 marks. Final merit list will be prepared on the basis of marks obtained by the candidates in the Mains examination and interview examination. Syllabus will be same for cdpo Mains examination which is specified for the Patna University BA Honors program.